Huge NIS 5 billion initiative to build tens of thousands of bomb shelters and fortify hospitals. 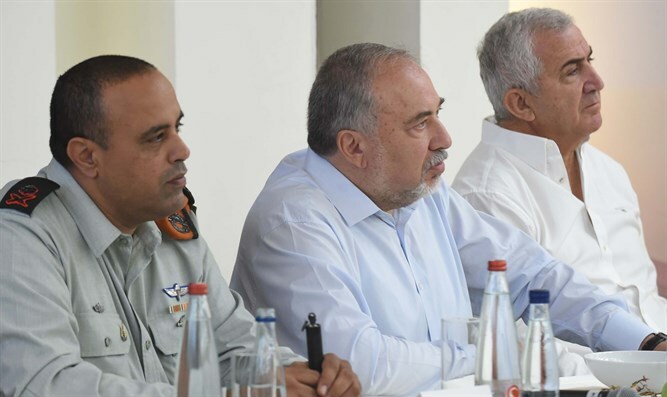 Defense Minister Avigdor Liberman announced on Thursday that Israel will undertake a massive NIS 5 billion effort to fortify the north and south from missiles and earthquakes. The plan, which was announced at a meeting with municipality heads from all over the country at the Defense Ministry's Tel Aviv headquarters, includes building thousands of bomb shelters for citizens in the north. The initiative also plans to allocate more than half of its budget to protect buildings against earthquakes, including strengthening public buildings such as hospitals and police stations. Israel has experienced a series of earthquakes recently, which has led to increased attention to the unpreparedness of large parts of its infrastructure. Experts in the field believe that the occurrence of a strong earthquake, with all its severe consequences, is almost certain to happen and its impact on different regions of the country will be enormous. According to the government-approved preparedness examination, in the event of a major earthquake, Israel could expect 7,000 fatalities, 8,600 people seriously injured, 37,000 people lightly injured, 9,500 people trapped in rubble and 170,000 made homeless. According to the data presented at the conference, the city of Tiberias has the largest concentration of buildings, 586 buildings of 3 floors or more that were established before 1980 and do not meet the construction standards for earthquakes. Followed by Migdal HaEmek with 343 buildings, Safed with 290 structures, Eilat with 162 buildings, Beit She'an with 144 structures, Kiryat Shmona with 118 buildings and Afula with 106 structures. These cities and other communities located in high seismic risk areas will receive special emphasis on the program. The plan includes the largest ever solution to upgrade public shelters in the north: 321 public shelters in 21 municipalities within a range of 0-9 km from the northern border will be renovated and adjusted for a long stay by the end of this year. Authorities within a range of 9-20 km from the border and later on the program will upgrade 510 public shelters in communities within 20-45 km of the border. Defense Minister Avigdor Liberman said that "this is the first time since the Second Lebanon War and the Winograd report that there is a comprehensive and systematic plan for protecting the home front, with an emphasis on the north of the country.